If Persian food was a type of clothing, it would be tie-dye—unique, full of colour and all mixed together—and Shiraz Persian Restaurant in East Perth would be a flower child. 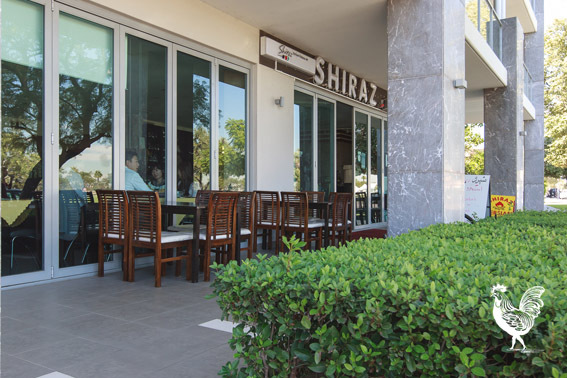 When you first walk into Shiraz, the elegant and bright décor around the place catches your eye, from the orchids in the corners to the shiny gold middle-east art on the walls. The gold adds a touch of Persian feel to the restaurant that is less than 200m from the Swan River. The view on a lazy afternoon was an added bonus but the food, served in generous portions, is good enough reason to rock up. I do not have much experience in Persian cuisines so I dragged along an Iranian friend to show me the ropes. We split the Shiraz Special ($35), a combination of three different kebabs—Koobideh, Barg and Jujeh—served with rice. The Koobideh surprised me a little. When I read on the menu it was ground lamb my expectations went down a little—even more when my friend told me it was food for children. But after the first bite they were right back up. The skewer retained a lamb-like taste to it but the onion it was cooked in added something extra. I wish I had been just as surprised by the Barg. Instead, I was underwhelmed by the overcooked and dry bit of lamb that washed away any flavour the Koobideh had left me. Thankfully, the Jujeh redeemed the dish. A vibrant yellow in colour, this chicken tenderloin had more flavour than a drag show. The meat was moist and the unique flavours popped when mixed together with the rice and Mast O Kheyar ($6), a mint and cucumber yogurt. To complement the meat and rice, we tried the Qormeh Sabzi ($22), a deep green mixture of kidney beans, lamb leg, dried lime and olive oil. Visually, it looked like a stew or soup but it was much thicker and went very nicely with the saffron rice. Even the tea at Shiraz was above average: The Chaii-simmered Ceylon tea ($2.50) had me pouring another cup. The spices were subtle and different and the added sugar cubes made it sweet and tasty. Although it may seem strange, you need to mix everything together to avoid looking like an amateur patron. In one spoonful, you may have five different dishes with five flavours—and that is the way it is supposed to be. I began keeping my food separate on the plate but finished with a colourful combination that blended everything together. Persian cuisine is unlike anything else—it’s not Indian, it’s not Turkish, it’s not Chinese—and that’s what made the food great. It’s unusual. While the food was great, I feel like I was robbed of the true Shiraz experience because I’d visited on a weekday afternoon. On weekends, they have music bumping and belly dancing in front of a packed restaurant. Instead, I experienced an empty restaurant on a slow Monday with no music and no dancing. I can only imagine that on the weekends, Shiraz turns from flower child into a full-out Woodstock.